Kevin Curtis enlisted into the United States Marine Corps in 2008 as a Military Police officer. After completion of basic training he was stationed with the 1st Marine Division at Camp Pendleton California where he deployed as part of a police mentoring and training team to Afghanistan where he helped to establish a detention facility. In 2011 Kevin was reassigned to the Provost Marshall's Office where he conducted law enforcement for Marine base Camp Pendleton from 2011 until his honorable discharge in 2013. While at the Provost Marshall's office he helped to train new Marines and civilian police officers to properly perform their duties as law enforcement officers as well as supervised up to 15 law enforcement personnel. In 2013 Kevin started working as a law enforcement officer in Martin. He is currently working for the Bennett County Sheriff's office as a Deputy Sheriff. Kevin is certified as a law enforcement officer by the state of South Dakota, he is also trained as an advanced crash investigator and conducts all crash investigations for the Bennett County Sheriff's Office. Lucas "Luke" Hamar has been involved in law enforcement for over 8 years. Luke started his law enforcement career after high school with the United States Air Force, Security Forces. After serving his country and an Honorable Discharge he began his career with Bennett County law enforcement. 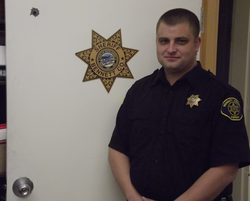 Luke has worked with the City of Martin, SD Police Department and the Bennett County Sheriff’s Office. Prior to being elected Sheriff, Luke served the City of Martin, SD as Police Chief. In 2011 Luke Hamar was elected Sheriff of Bennett County. Luke Hamar continues to try and improve the community both in law enforcement and in life. Luke Hamar works diligently to provide a safe and friendly environment for the community. When not at work Luke enjoys spending time with his family, hunting and fishing. In 2015 Luke made the decision to pursue other career paths and not run for reelection. Deputy Lewis has been working with the Bennett County Sheriff’s Office as a reserve deputy for a number of years. She helps out with court and housing prisoners. Sue, along with her husband have a business in Martin. She enjoys the community and helping make it a better place to live. Deputy Rayhill has worked on and off with the Sheriff’s Office for a number of years. Gary enjoys helping the Sheriff’s Office with court days and housing prisoners. Gary is active with community events including hunter safety classes and archery classes. Gary also host’s a women’s shoot, which provides instruction and training to the women of the community on the safe use of firearms.